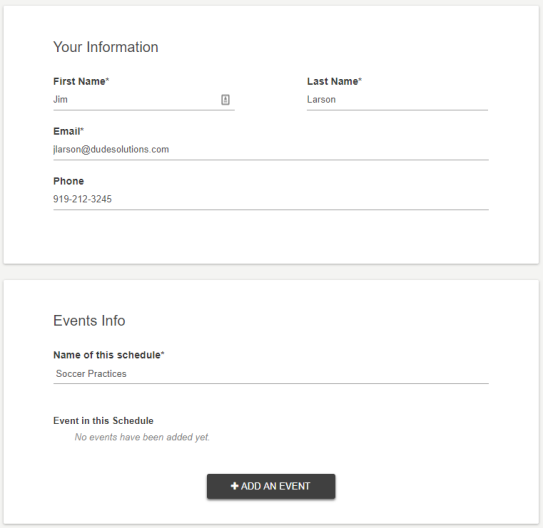 In Event Manager, Quick Forms provide a way to share a Site specific event form with people who need to quickly add events without the need to create an account. An Administrator can provide the shareable link to whoever needs to enter events, and they can add as many events for that site as necessary while the form is enabled. Click on the Quick Forms tile. Select the Site from the drop down menu in the top right corner to generate the Quick Form. This will auto-populate the quick form link for the corresponding site. If you would like any event requests submitted through a Quick Form to bypass the site's approval process, check the box next to Automatically approve events submitted through Quick Forms. *Note: Checking this box will apply this automatic approval to Quick Forms at all sites. Check the box next to Quick Form enabled. This will enable the Quick Form for the link that has been generated. 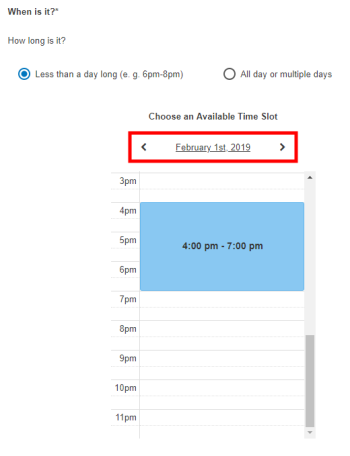 Once the Quick Form has been enabled by an Administrator, anyone with the link can utilize this form to enter a schedule of events. Enter the Name of this schedule. Click Add an Event. This will expand the form so that events can be added to the schedule. Select the Location for this event from the Where is the Event? drop down menu. Define the length of the event by selecting Less than a day long or All day or multiple days. Use the arrows to define the date for the event. Use the arrows to define the month of the start date and click on the date desired. 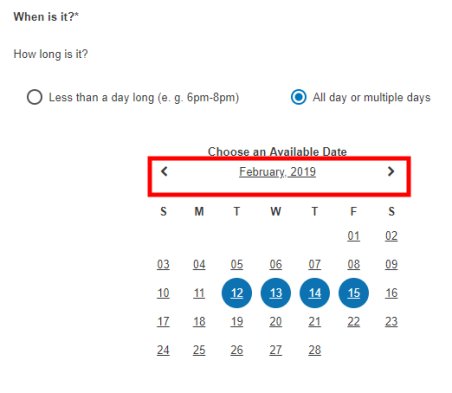 In the pop-up window, confirm the Start Date and select an End Date. Enter a summary for this event in the text box. *Note: There is a character limit of 250 for this field. 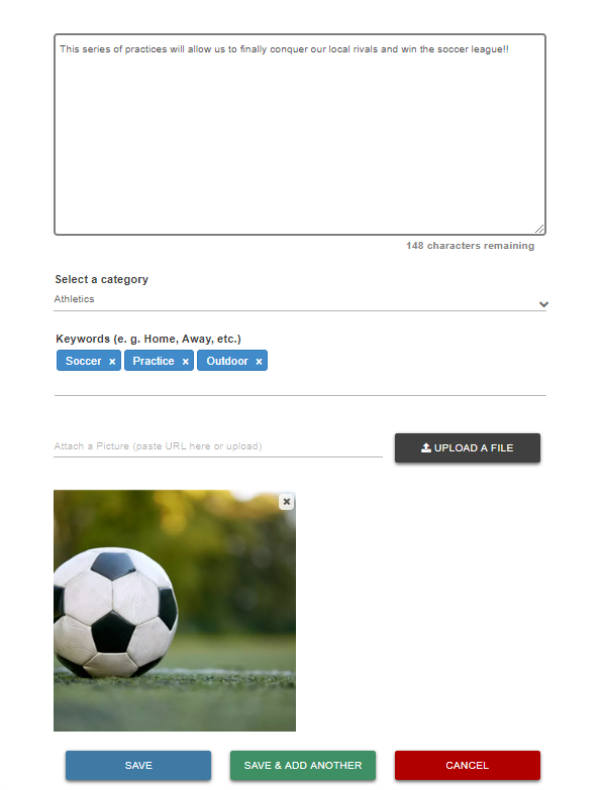 Upload a file by locating it on your computer, or pasting the attachment URL in the text field. Click Save, Save & Add Another, or Cancel. Save: This will finalize the changes for this event. Save & Add Another: This will finalize the changes for this event and allow you to add another event to the schedule. Cancel: This will negate any event changes you have made. Check the box next to I'm not a robot and click Submit to finalize all changes.